Located on the coast of Tallinn, Patarei Sea Fort is the largest and most impressive classicist style defence ensemble in Estonia. Its construction was started in 1829 by order of the Russian Czar Nicholas I and it was completed in 1840. Spreading over four hectares, it consists of a curved wing facing the sea (247 metres in length), two radial wings (each 124 metres in length) and a mortar battery. The complex has performed many functions, reflecting the dramatic and manifold history of Estonia. Between 1920 and 2005, the for was converted into a prison, having become a powerful symbol of national resistance to both the communist and Nazi regimes. The buildings have stood empty for more than a decade, suffering numerous acts of vandalism. The main threat to the ensemble is its rapid deterioration due to the harsh climate and the lack of maintenance. The roof and windows are severely damaged letting both rain and snow in, while the water has caused the timber constructions and limestone walls to suffer greatly. The walls are moist throughout and extremely wet in the basement and on the ground floor. Several areas are closed for safety reasons. If no emergency actions are taken to stop the rapid decay, the buildings will be irreparably lost. 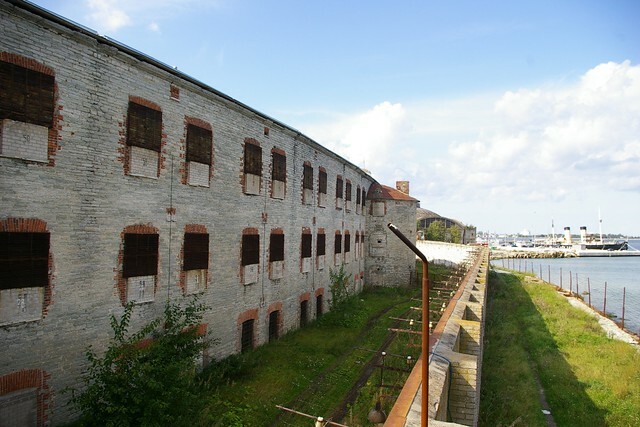 The Estonian Heritage Society, which made the nomination for ‘The 7 Most Endangered’ programme 2016, proposes the complete rehabilitation of Patarei Sea Fort and the installation of a museum complex, a centre for cultural and creative industries, a hotel, or offices and apartments. The nominator advocates that Patarei has the potential to become a major tourist attraction in the Baltic Sea Region, in combination with the adjacent Tallinn Seaplane Harbour, a Grand Prix winner of the EU Prize for Cultural Heritage / Europa Nostra Award in 2013, and the Old Town of Tallinn and the Suomenlinna Fort in Helsinki, which are both included on UNESCO’s World Heritage List. The Estonian War Museum, the Finnish War Museum, the Baltic Initiative and Network, Estonian Military Heritage, the Sihtasutus Mänguväljaku Fond and the Centre for Sustainable Renovation are among the partners of the campaign to restore this historic site to life. Patarei Sea Fort is under the ownership of the State Real Estate of Estonia (RKAS).